Lately, I’ve been on a Banana Bread craze. I can’t get enough of the fluffy and soft texture and banana and maple syrup sweetened taste. 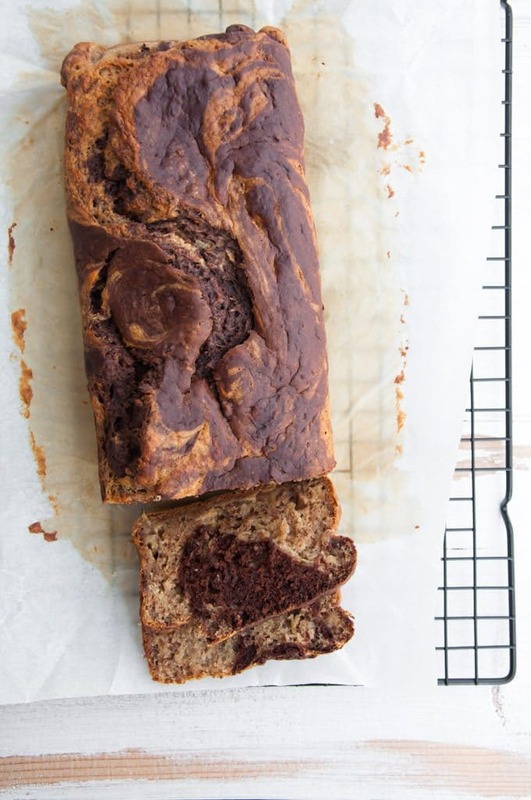 And while I love a simple Banana Bread, this Marbled Banana Bread takes the whole nana-bread-thing to the next level. 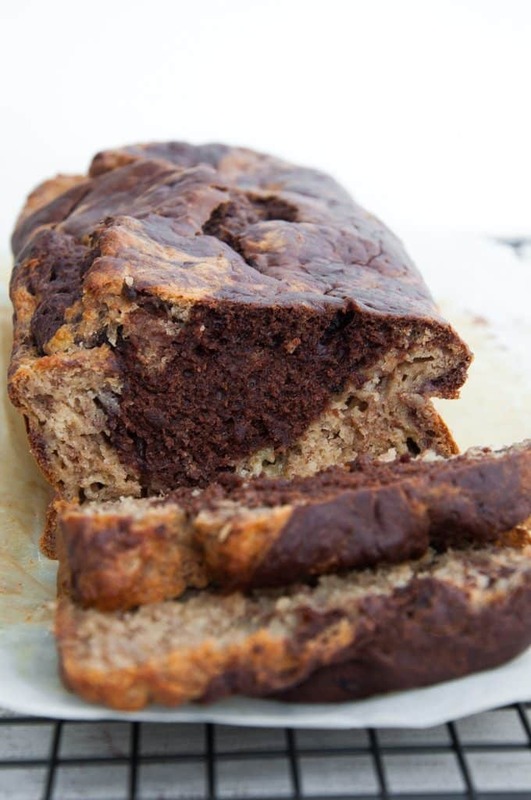 The best part is, that it’s hardly any work to make chocolate swirls, just add 3/4 of the banana bread batter into the loaf pan, then add cocoa powder, chocolate chips and a bit more rice milk to the last 1/4 of the batter, add it to the loaf pan and swirl it around. No need for an extra bowl or anything! Bake it in the oven until perfectly golden on top, check the inside with a wooden stick and off you go into banana paradise! Warm slices of Banana Bread fresh out of the oven are the best. thing. ever. 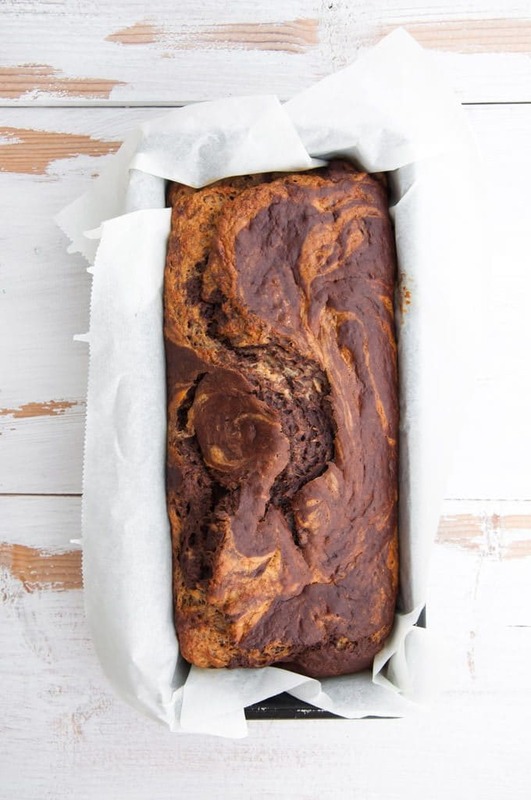 Recipe for a vegan Marbled Banana Bread - easy to make, uses simple ingredients and taste absolutely divine! Preheat the oven to 320°F/160°C and line a loaf pan with parchment paper. Peel the bananas, add them to a large bowl and mash them. To the bananas, add the plant-based milk, coconut oil and maple syrup. Give it a quick mix. Add the flour, baking powder, baking soda, cinnamon powder and a pinch of salt to the wet ingredients and whisk everything together. Pour about 3/4 of the batter into the loaf pan. With the rest of the batter, add in the cocoa powder, chopped chocolate and 1 teaspoon of plant-based milk. Whisk and pour into the loaf pan. Swirl it around to create the marbled look. Bake it in the oven for about 1 hour or until golden brown on the top. 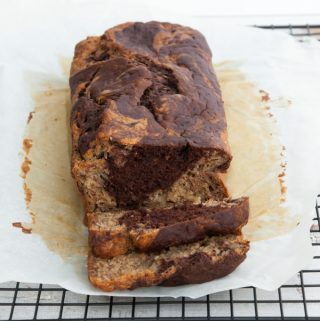 You can use a wooden stick to test if your banana bread is done in the middle. 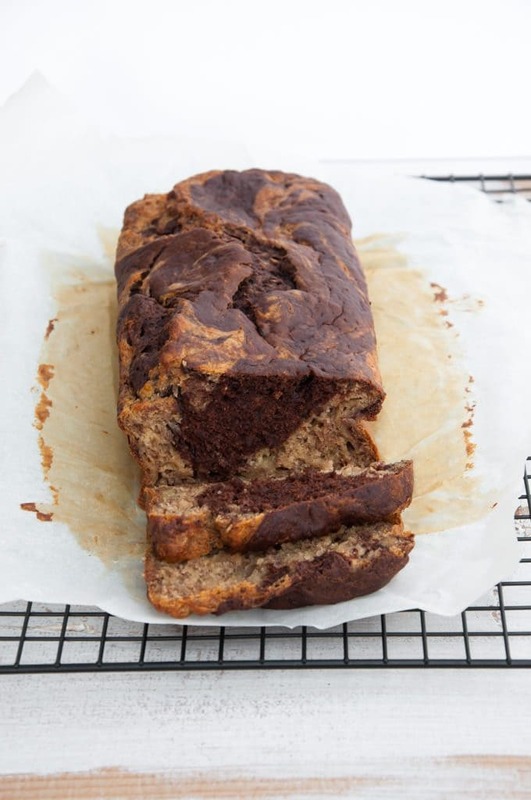 Did you make this vegan Marbled Banana Bread? Tag @elephantasticvegan on instagram and use the hashtag #elephantasticvegan. Don’t forget to subscribe to the Elephantastic Vegan Newsletter to see Reader Remake Features! 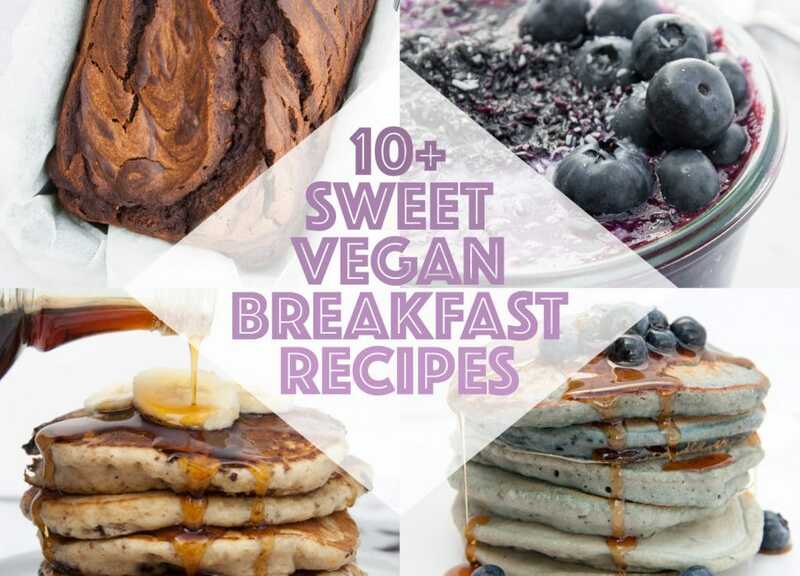 Looking for more Sweet Vegan Breakfast Ideas? 10+ Sweet Vegan Breakfast Recipes – waffles, pancakes, granola and more! Hi! I just made this banana bread following your recipe. I find that it was denser than what I would have liked. Any ideas to lighten the crumb up? What about yeast? 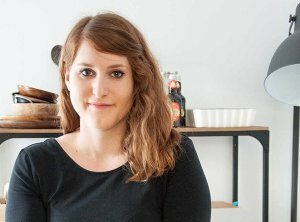 Hi, is there any way I can substitute oat flour for the flour in the recipe? -Maybe my bananas weren’t ripe enough (or not big enough) but I found the bread too lightly sweetened for my taste even after adding 2 Tbsp of sugar. I realize people like different sweetness levels, but I would describe myself as being on the but-not-too-sweet end of that spectrum. In case you need a baseline, I’m the kind of person that drinks their coffee black (without sugar), eats 90% chocolate, and will take rapini over sweets any day. -I found the chocolate flavour too subtle. I definitely think this could be chocolatier. -The bread was too dense for my taste. -The bread wasn’t moist enough. -Since there’s no loaf pan size directions the baking time could vary dramatically. For instance, I baked mine for 50 mins and I think it was over-cooked. -You describe being able to “pour” the batter into the loaf pan an easily being able to make swirls. That wasn’t my experience at all. The batter was highly viscous and had to be “spatulad” into the loaf pan. My suggestions: Add 1/4 of brown sugar or use really ripe BIG bananas, 1/4 Cup coconut oil instead of 1 Tbsp, Double the cocoa, and add 2oz of melted dark chocolate, and maybe 1/4 Cup more milk. If I can find really ripe bananas today I’ll make it with my changes and report back with what I found. thank you so much for your detailed feedback – I really appreciate you taking the time to write everything down! I found it extremely dense…but still tasty! Mine was done at 45 min. All ovens are different I suppose. I only used two bananas and it came out great! Gracias!